An ad agency exec, a firefighter and a doctor – three different people with different life stories. Yet they all share a love of Pierce College – where they got their start – and a desire to inspire today’s students. 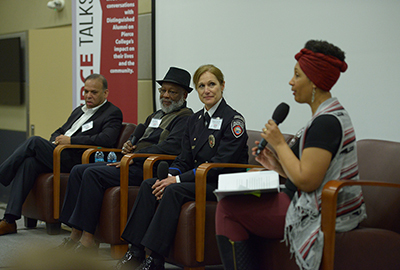 Recently, they shared their stories with about 100 students, staff, faculty and community members who turned out Jan. 24 for Pierce Talks at Pierce College Fort Steilacoom. Modeled after the popular TED Talks, the event connects students with alumni who are eager to inspire and challenge the next generation. “It’s very important for us to have access to alumni who have been successful and gone into the community and made a difference,” said Melonie Rasmussen, event moderator and math professor. First up was Jerry McLaughlin, a retired, former co-founder of what is now JayRay, the South Sound’s largest advertising/public relations agency. McLaughlin won the Pierce College’s first Distinguished Alumni Award in 1981. “It was one of my proudest moments,” he said. “I’ve been blessed that so many of my dreams came true,” McLaughlin said. “What made it possible for a D-minus high school student like me to go to college? After high school, McLaughlin worked at McDonald’s with the idea of someday becoming an assistant manager. A basketball coach at Pierce College convinced him to quit his job and become a full-time student and join the basketball team. At Pierce, McLaughlin found another mentor in Glen Graves, a part-time advertising instructor and later, a founder of JayRay. After graduation, McLaughlin went to work for JayRay and stayed for 37 years, building business and community relationships while helping the company grow. “Along the way I was able to give back to this wonderful community,” he said. He served on many non-profit boards and helped raise funds for organizations including Junior Achievement, Tacoma Urban League, Rotary 8 and the Greater Tacoma Community Foundation. Today, six years into retirement, McLaughlin serves on the board of Palmer Scholars, raising funds for minority scholarships. The event’s second speaker was retired Tacoma firefighter Karen Leming, also a power lifter, wife and mother of four sons. Leming won the Pierce College Distinguished Alumni Award in 1991. She was one of the first local women to become a firefighter in the 1980s. Her path was not a straightforward one. A high school graduate, Leming didn’t know what she wanted to do as a career. So, she studied data entry, enrolling in 1978 at Pierce College (at that time, Fort Steilacoom Community College). In 1979, she changed her major to Parks and Recreation. Around this time, a friend “planted the seed” that she should take the Fire Department exam. She married in 1981, attending Pierce College for three years. She had three sons in 1982, 1984 and 1985 (and a fourth son later). In 1986, Pierce County Fire District 7 (the Spanaway area) was seeking volunteer firefighters. Leming passed the physical exam and interview. From 1987 to 1991, Leming worked for the Fire District, where she learned from many mentors. In 1991, she joined the Tacoma Firefighters. With four sons and a demanding job, Leming became the family breadwinner as her husband stayed home full-time to care for their children. “I had an amazing career with Tacoma Fire,” she said. The final presenter was Dr. Stan Flemming, currently director of Swenson Medical Affairs. He is a former state legislator and retired Army Brigadier General. Flemming humorously recounted his own post-high school journey. His father, a firm believer in the “Once you’re 18, you’re on your own” philosophy, escorted him to the bus station, expecting him to figure out his path from there. Flemming went to stay with his older brother (who had been similarly encouraged to leave the family nest) while deciding what to do next. Like the other speakers, Flemming stressed the importance of seeking out mentors. Flemming encouraged students “to be engaged with your institution. Institutions don’t get better without input from students. They want to hear about how they can be better, so get involved with your community.